I am frequently asked by those who are pursuing a content marketing strategy what they can do to make the process easier and provide higher quality information of value for their customers and prospects. - Who are your target personas -- who are you trying to reach? - What are your goals -- awareness, traffic, leads, dialog, SEO? - When do you want to reach your target in their journey -- top of the funnel (awareness, research), middle of the funnel (RFI, short list, competitive evaluation), bottom of the funnel (meeting with vendors, purchase decision)? - Where do you want to reach your target -- where will they be most receptive to your message, where are they going to be looking for information of value? - Why does what you are sharing matter -- is it really information of value or all you doing a brand dump, or selling? Create one big piece of content and then break it down into different content types that can be shared across many channels -- blog posts, white papers, videos, ebooks, infographics, testimonials, FAQs, case studies, webinars, newsletters. Tell a story that is different and unique to you and your business. What business problem have you solved with a creative solution? Be useful. Answer questions before people asked them based on the questions you've been asked many times before. The more time you save your customers and prospects, the more you make it sinple and easier for them, the more likely they will become long-term customers. Have a content generation mindset and inculcate that mindset into your employees. Content is everywhere. One of the best sources I heard lately are the emails members of the sales team are sending to clients or prospects. These emails are likely answering questions or objections. Do more. The more you do, the better you'll get and the more analytics you'll have to let you know what is, and is not, working. B2B companies that blog generate 67% more leads than companies that do not blog (Hubspot). Be a better writer. Tell better stories. The more you write, the more you share, the more you have a chance of stirking a chord with a prospect or a customer. Write emotionally compelling content to increase the likelihood that your content will be share with others. Ask them how you are doing. Listen intensely to what they have to say. Ask follow-up questions to let your customer know you're really concerned with what they have to say. I am consistently surprised by the lack of contact with customers that top management has at some of the companies with which I've worked. On a scale of 0 to 10 where 10 is "definitely," what is the likelihood that you would recommend us to a family, friend or colleague? If we have not done so, what can we do to earn a 10? NPS surveys are a great way to begin a dialogue with your customers. If you're going to ask your customers what you can do to improve the customer experience, be prepared to address their suggestions. And, thank them for their feedback. Improving customer service may mean focusing your effort on interacting with customers via social media. When you have an actual dialogue with your customers, ask them what you can do that's best, easiest and most convenient for them. Anything you can do to save your customers time and make their lives easier will be remembered, appreciated and shared by your customers. You will also increase the likelihood that they'll be repeat customers. There's no substitute for asking questions and listening intensely to your customers. It makes them feel invested in the company improving customer loyalty and retention. It also gives you the opportunity to get insights into the consumer that has never occurred to you or your team. For example, have you ever asked your customers who they consider to be your competition? Do it, you might be surprised by their answers. Empower your employees to engage your customers as well. The more your customers know you and your employees care about them, the more likely they are to develop an emotional connection with your brand. Gallup Research has a proven customer engagement instrument that comprises actionable question items with proven links to customer behavior. Gallup's analysis has found that fully engaged customers are more loyal and profitable than average customers in good economic times and in bad. 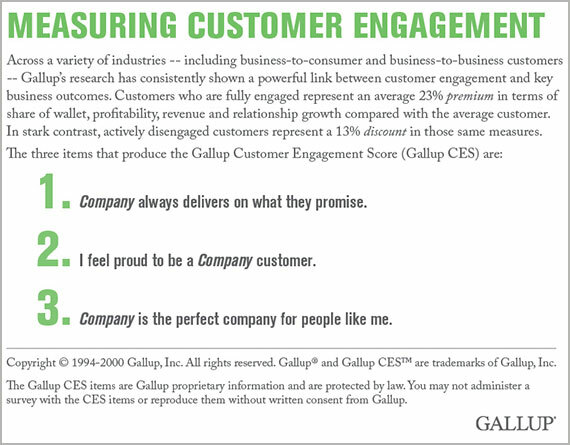 Across a variety of industries and target audiences, including business-to-consumer and business-to-business, Gallup's research has consistently shown a powerful link between customer engagement and key business outcomes. Data reveals that a customer who is fully engaged represents an average 23% premium in terms of share of wallet, profitability, revenue, and relationship growth compared with the average customer. In stark contrast, an actively disengaged customer represents a 13% discount in those same measures. When businesses can provide the meaningful experience their customers want, they realize greater rewards in terms of loyalty and profits. Though it can be difficult for businesses to connect with their customers on an emotional level, it can be done be listening and establishing a trusting relationship that's mutually-beneficial for the customer and the business. What actions are you taking to enhance customer engagement? Note, none of these are related to more money. They are related to making an emotional connection with the people that work for and work with. Having a conversation with you employees will help make that emotional connection. You'll get to know their needs, desires and aspirations. And if you're committed to helping them meet their needs, desires and aspirations, you'll have an engaged and empowered employee who wants to help make you and your business successful. I heard a great story about a call center, a line of work notorious for turnover, who had tremendously loyal and engaged employees who provided outstanding customer experiences. As part of the interview process, the hiring team determined what an employee wanted to ensure they'd be happy in the position for two to five years. In one case, a single mom wanted a steady job that would give her the flexibility to support her two kids while going to school to get a degree in psychology. Once the team learned what the potential employee wanted, they researched the courses the employee would need to get the degree at a local community college and got back to her in a couple of days with an offer that included how she would get her degree. An employer that goes to those lengths for their employees earns a lot of trust and loyalty, as well as an engaged and empowered workforce that differentiates them from their competition. Head = "I believe." I believe the products and services we produce and sell are the best for our customers. Heart = "I'm inspired." I'm fully aware of the vision, mission, values and strategic positioning of the firm and am excited about the direction of the company. Actions = "I will give discretionary effort." I will recommend our products and services to my firends and family, as well as to our prospects and customers. I will do my best to ensure our customers have an outstanding customer experience. If you're interested in having an engaged and empowered group of employees, talk with them to find out if they're the right fit for your organization. If they are, learn what they need to be engaged and empowered. Engaged and empowered employees will grow your business by producing better quality products and services and providing more outstanding customer experiences. This will result in more loyal customers who will spend more and be worth more, over time. Interesting article in a recent edition of Marketing News entitled, "A Peek Behind the Arches." The article is the result of an interview with Joel Yashinsky, CMO of McDonald's Canada. Joel is leading McDonald's Canada's transparency marketing campaign called, "Our food. Your questions." The campaign includes a YouTube channel with videos of a McDonald's photo shoot to show how the food is prepared for advertising and a tutorial on how the hamburger patties are made. The goal of the campaign is to inform customers about the food in a way that made an emotional connection with the customer and facilitate a conversation. The campaign was in response to the amount of misinformation in the market and the fact it was growing. A perfect example of consumers filling a void if you and your firm are not participating in social media. McDonald's Canada has received more than 20,000 questions on their website, through Facebook and Twitter. They have answered all of them -- a key element of the transparency of the campaign. As a result, brand health, brand trust, scores on food quality and "food they feel good about eating" have all increased significantly. The campaign has given McDonald's Canada the opportunity to tell their story about their food and addressing rumors directly. For questions about the health of the food, McDonald's provided information and specifics to educate consumers about what the truth was. It will be interesting to see if McDonald's uses the campaign in the U.S. in response to Chipotle's "Farmed and Dangerous" shot at fast food and corporate farming. There is no doubt openness, transparency and authenticity are critical for a brand today. The more open you are as a company, the more your customer is going to appreciate you. While I will continue to eat at Chipotle every day, I do respect what McDonald's Canada is doing more than I like Chipotle's "Farmed and Dangerous" campaign. Has your firm embraced a culture of transparency, openness and honesty with your customers and prospects? Nice ebook from Dynamic Signal "An Introduction to Employee Advocacy" which affirms what I have shared in several posts -- empower your employees and they will help you build your business. Empower and encourage all of your employees to send out positive messages and attract new customers, generate referrals, recruit great hires and tell a consistent story about the brand. If your don't trust your employees to do this, how are you failing to earn their trust? Employees will only treat your customers and well as you treat your employees. Channel the passion and knowledge of your employees so they reach out to their social networks and amplify your brand. Ensure your employees are engaged and are fully aware of your vision, mission, values and strategic position. Doing so will drive leads, revenue and profit and further engage your employees. According to Edelman's 2013 Trust Barometer, "41% of people believe a company's employees rank higher in public trust than a firm's P.R. department, CEO or founder." When you empower your employees, your employees trust you and their social networks trust them. Their family, friends and colleagues see them enjoying their jobs, in person and online, and start to think more highly of the company. For every 1,000 employees, companies can gain more than $1 million in earned media, save $500,000 in recruiting expense and geenerate millions in incremental sales. According to Gallup, "companies with engaged employees outperform those without engaged employees by up to 202%." Have a social media policy that's accessible and understandable. Explicitly tell people what you want them to share like a press release or video. According to McKinsey, "when marketers empower their employees, they stand a much better chance of reaching customers in the right place, at the right time, with the right message." According to Social Media and Sales Quota Report, "78% of salespeople using social media outsell their peers." Reviews, recommendations, case studies, purchase history, coupon redemption and ecommerce will all provide feedback on whether or not your employee empowerment initiatives are working. Employees are your best sales channel, your best advocates and the greatest promoters of your brand.